Well despite the surf tag to this blog managed to do a trick for a change. Easter Monday and it was cold …. Leo (new dad to little Angus – well done) was up for a kite… As was I but weather looked cold. Windguru said 4C degrees and 20 knots …. Nice wind chill there. But we were gagging to get out on the water. 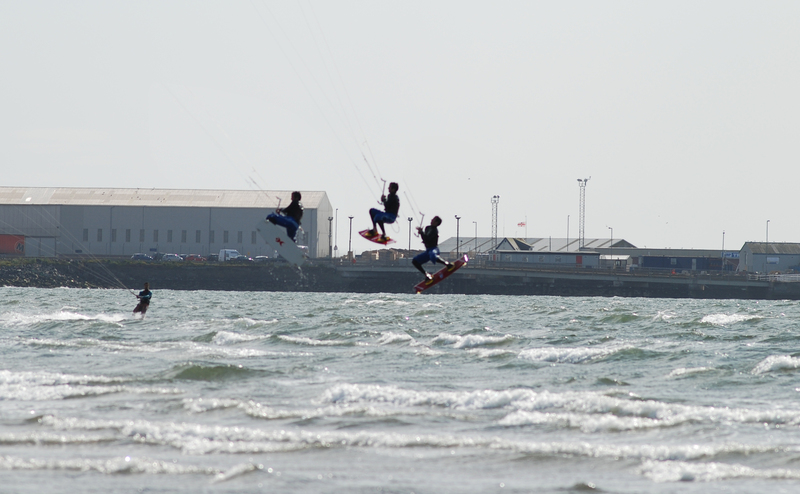 So 10am pickup and Leo is talking me through the intrinsics of doing a kiteloop … Never really been my bag as my kiting is generally just jumping or preferably waveriding.Still he makes it sound straightforward. 3. Nearing apex move both hands to back of bar, pull hard and hold on. So once used to wind chill and slight snow/ice flurries … Went for it. One first 2 I wiped out – first one just caught by surprise and second just fluffed. 3rd time lucky though but jump was pretty pathetic and only 5 foot high max …. But I have to confess I was chuffed. Now no 2 and as Leo heads out I think “witness” and I pull off another one – he said it looked great 12 foot up and nicely powered …. This from a guy who regularly does moon landings. So a great day for me – I’m sure the waroo made it feel easy – and Leo was dead chuffed too as he landed a “blind judge wrapped?” Not totally sure what that is but it is one of those hard spinny kiteloop + handlepass things. So the ante is raised and now it’s up to Ed to do one …. Its taking years for us old boys but I think we are finally getting it. Going out for a ride tomorrow. Not been on the bike nearly as much as I would like. Rohloff shifter (twist) has been playing up. I think a few of the wipe-outs in the race snapped / cracked the cables and recently its been a bugger to shift…..
Tied the cables again and tightened the shifter last night … last ditch choice before I reinstall the cables. Shifting is possible the only bad point about the Rohloff.